The hope celebrated on Easter Sunday is like sunrise after a dark and stormy night. Nashville First Baptist Church has been sharing this hope for almost 200 years in the heart of our city. We will do so again this year, guided by the moving narrative found in the gospel. Join us for Communion on Palm Sunday (April 14), a Good Friday Service at 11:00 a.m. (April 19), and then come celebrate the resurrection of our Lord on Easter Sunday Morning (April 21) in one of our three morning worship services. We hope you’ll be with us on Easter Sunday. Invite your friends and loved ones. A liturgically-based service with contemplative elements and Communion. 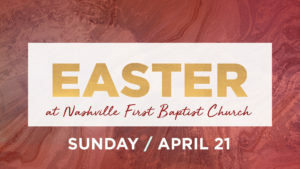 In addition to our Lot C and Lot A parking, the Bridgestone parking garage is free to Nashville First Baptist members on Easter Sunday. We continue to provide Custom’s House fenced lot parking privileges, as well. We are asking all “able-bodied members,” deacons, Sunday School workers, choir members, and greeters to use the garage, so our seniors, young parents with infants, and guests can park closer to the church. Our friends at Bridgestone will open parking at 7:45 a.m. If you can help with this, please know we appreciate it!